Wondering what the heck is the deal with macros?! I’m sure you’ve seen this term thrown around my page and other fitness gurus alike – so I wanted to break things down for you. Tracking macros, like in If It Fits Your Macros (IIFYM), sounds like a great plan, sure! 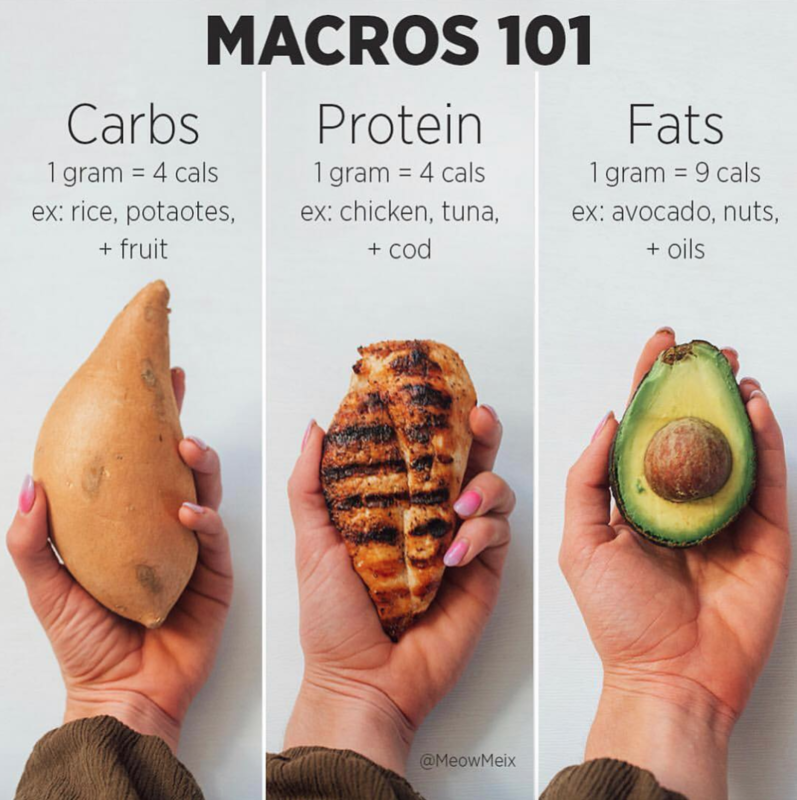 You can eat whatever you want, as the name implies, if it “fits within your allotted macro count for the day.” While tracking macros can be a helpful tool, and may help you tweak your nutrition to really meet your goals, it’s not for everyone. I always want to provide you guys with opportunities to refine your health and fitness regime – but remember, all of my tips are not a one-size-fits all and I always like to preface with that! Whether you end up following that plan or not, it’s a good idea to know a little about macros in general. “Macros” are macronutrients, aka the biggest nutritional components of your food – are carbohydrates, protein and fat. Most foods are made up of two or even three of the macronutrients, as well as vitamins and minerals, which are considered micronutrients. Avocados, for example, are predominantly fat but also contain carbs, mostly from fiber. Bet you didn’t know foods like avocados even have carbs! Most diet plans, even the old school food pyramid, are based on the idea that you need a certain amount of each macronutrient to maintain outstanding overall health. Plans will differ in the proportions of each, depending on the goals of the plan. Generally, most people should get 45–65% of their daily calories from carbs, 20–35% from fats and 10–35% from protein. If you’re looking to gain muscle, you’ll want to have a higher percentage of your diet coming from protein and smaller percentages, within those ranges, coming from carbs and fat. It can also be helpful to remember that genetics will play a role in your optimal macro breakdown – some people can tolerate more fat or carbs in their diets than others, for example. Tracking macros for a short period of time, in addition to calories, is a nutrition strategy which can help you hit your goals…and that’s a FACT. It can help keep you on track and help you avoid splurging too much – which might make it easier to run your fastest mile, or lift a certain amount of weight. At the same time, fans of IIFYM say they love it, because they feel the freedom to enjoy those “splurge” foods in moderation. Just because you can eat those splurge foods, doesn’t mean you always should. You’re going to be able to eat more food and get more important vitamins and minerals if you’re mainly eating nutrient-dense, whole foods. As you all know, processed foods tend to pack in the calories in small portions with few vitamins or minerals (if at all). This is how being strategic in tracking your macro portions and calorie intake (deficit for weight loss, surplus for muscle gain) can help you reach your fitness goals. It’s also important to remember there are many other factors that affect weight loss including the quality of food, sleep, stress levels, how much you exercise, and what types of exercise you do. Like I said, tracking macros is not for everyone, but it’s worth knowing about macronutrients no matter what you choose! Whether you love tracking macros or prefer another strategy, make sure most of your meals are made up of high, quality whole foods and you’ll be in a good place!